Are you interested in a humanity moving away from worsening pollutions and other environmental destruction, wars, and other social injustices, which are destroying human survival internationally? Are you interested in the development of an economy which serves the pursuit of the quality-of-living of all people in society, rather than the pursuit of greed by a handful of elites who own Big Business interests? Are you also interested in what is the mentality which motivates the prevailing economic system to ignore mass human suffering, and systematized environmental destruction? Did you ever wonder what mentality drives the economic system to ignore such a scientifically well-established catastrophic planetary threat as "Global Warming"? 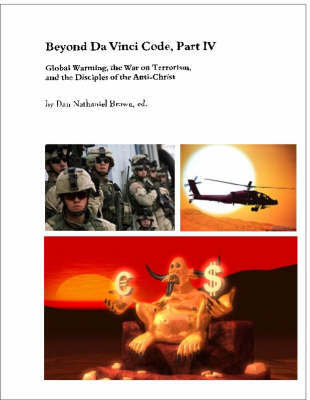 This book explores disciples of the teachings of the anti-Anti Christ, which is destroying human quality-of survival, and planet Earth in general. As Jesus had disciples who sought to spread lovingkindness, and values associated with human rights, social justice, and environmental protection, the disciples of the Anti-Christ seeks to destroy that spiritual legacy. The prevailing capitalism in association with Corporate Globalization and a so-called "War of Terrorism", has become the means for the disciples of the Anti-Christ to mislead humanity into a path of greed, exploitation, and threatened self-destruction. The affirmation of human quality-of-survival, from reversing the imminent planetary threat of Global Warming to ending contrived genoicidal wars, relies on elevating human consciousness toward spiritual elightenment, and way from the greed and exploitation-centred context of the Anti-Christ. The Bible in association with the scriptures of other world religions, provide, in part, vital insights toward the social rejuvenation of humankind. Dan Nathaniel Brown has a comprehensive background in the study of religions, political philosophy, and democracy. He has worked as a consultant, professor, and for cable television.